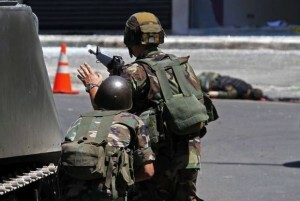 WASHINGTON — An army checkpoint was hit by a suicide bomber this past Saturday, killing two Lebanese soldiers and a civilian with a car bomb. Reuters reported that the bomb went off close to a pro-Hezbollah area in northeastern Lebanon. The anti-Shi’a militant group, the Nusra Front, claimed responsibility for the suicide bombing. The three-year-old civil war, pitting Alawites and Shi’a Muslims against Sunnis, has created a similar situation in Lebanon. Hezbollah, an Iranian-backed terrorist group, has a strong presence in Lebanon and has helped the Syrian government led by Alawite Bashar al-Assad. This is not the first such attack against Hezbollah supporters, with the capital city of Beirut seeing car bombs in recent months.